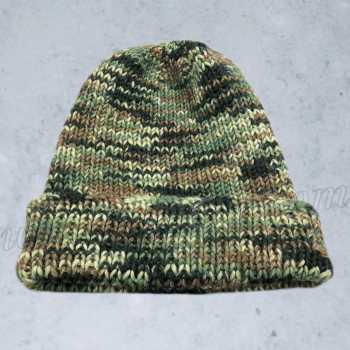 Free pattern for a knit camouflage hat for soldiers/hunting in cold climates. This hat is very soft and warm, and is an essential accessory to stay comfortable and warm. Made entirely in 1x1 ribbing, this hat is stretchy and will fit most adults. With Size 6 circular needles, cast on 100 stitches. Join; place marker to mark beginning of round. Work (K1, P1) around. Continue till piece measures 9.5" from beginning. *Note: If a beanie style is preferred (ie without the folded edge, work K1, P1 till piece measures 7.5" from beginning. Cut yarn, leaving a tail of about 8". Weave through remaining stitches, removing stitches from knitting needle. Draw up tightly and bind off. Weave in all loose ends.